I had leftover applesauce from Hanukkah, and it (unfortunately) wasn’t the nice homemade stuff. It was basic, store-bought, unsweetened applesauce. And because I prefer savoury latkes with sourcream and chives, there was most of a jar left over. I decided to hunt for recipes to bake with applesauce. 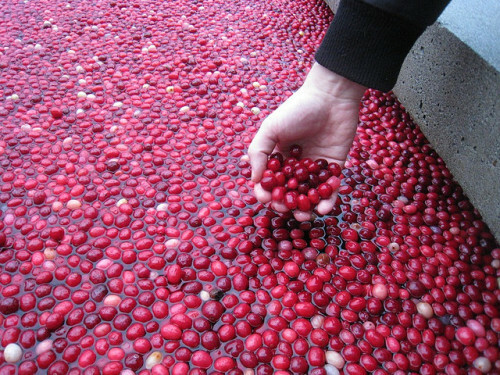 When I saw a bag of fresh cranberries on sale, I added that to my search. 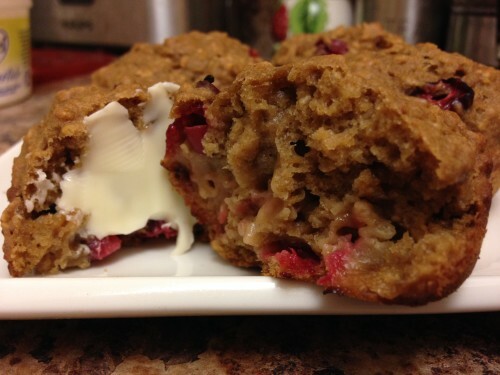 I discovered a lot of oatmeal blueberry muffin recipes, but very few cranberry oatmeal muffin recipes. Or if I did, they called for dried cranberries (which are inevitably sweetened) or non-household ingredients (at least for me) like buttermilk. 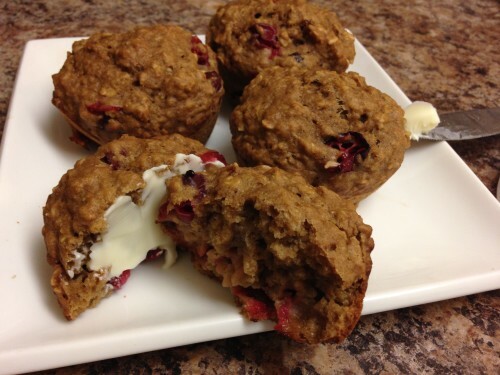 Or if they were cranberry-orange muffins, they didn’t have oats and applesauce. I know I could have made substitutions for buttermilk, or gone without oats, but I didn’t want to. I couldn’t find exactly what I wanted, but I managed to find some two base inspiration recipes: TastyKitchen’s Cranberry Applesauce Muffins with Pecans and Oatmeal Berry Muffins from Two Peas & Their Pod. So I amalgamated those two to create cranberry-orange muffins with oats and applesauce. Chop berries and coat with granulated white sugar (optional). Set aside. If your berries are small-ish (like pea-sized) you probably don’t need to chop them. Mine were massive, like grape-sized, so I cut them in half. In separate small bowl, combine applesauce, oil, egg, and vanilla. In a large mixing bowl, combine oats, flour, brown sugar, baking soda, cinnamon*, and salt. Add wet mixture to the dry ingredients and stir until just combined. Fold in the cranberries and orange zest. Prepare muffin tray (12 cups) — either with muffin liners or non-stick cooking spray. Spoon muffin mixture evenly into the muffin tins. Bake for 20-25 minutes, or until an inserted toothpick comes out clean. Cool before removing from the pan. * Next time I will omit the cinnamon. I find it competes with the orange zest. The cinnamon was from the inspiration recipes, neither of which included orange zest. Kind of giggling…I go through all of that that you did, then add in the gluten free element. They sound yummy. Well, if you have a preferred GF flour substitution, you can just replace it for the all-purpose I believe. Do oats have gluten?